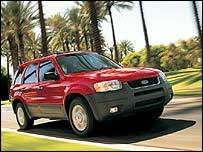 Profits at Ford, the second-largest US car maker, have more than doubled during the first three months of 2004. Net profits rose to $1.95bn (£1.1bn) for the quarter, up from $896m during the same period of last year. Ford's profits were boosted by a 9.5% rise in car sales to $44.7bn and by strong earnings from car finance. This was the first time since 2000 that earnings from car sales were greater than earnings from the finance division Ford Motor Credit. The group's recent cost cutting also contributed to the strong result which was much better than expected. "This is the best quarter we've achieved since we began our back-to-basics efforts more than two years ago," said chairman and chief executive Bill Ford. "It clearly demonstrates our plan is working and building momentum. "Our product lineup continues to strengthen with new vehicles such as the Ford Escape hybrid, Ford Mustang and Land Rover LR3/Discovery."